Report from Warsaw – Who Bears the Cost for Climate Change? Well produced short doc summarizing the current report. Methane bubbles rising from the ocean floor. I’m on my way to take a dog to the vet, and, well, I need a stool sample. Not mine, his. Anyway, this is not a methane joke, just means, I’m in a rush. Important: Everyone should know that the Guy MacPherson-imminent-global-doom scenarios are not real, and not helpful. You should know that the scientists I find most credible and thoughtful are somewhat pissed at the methane-hair-on-fire crowd for overstating what is a real problem. Methane is a problem, and as these recent studies show, one that is being better quantified and studied now. This has implications for livestock production, the fracking industry, and dreams of harvesting methane clathrates for energy production. The answer has always been no, until now. Gore’s recent decision to forgo animal products surfaced as an offhand reference in a Forbes magazine piece about Hampton Creek Foods, an upscale vegan product line carried in Whole Foods. Ryan Mac’s article, which posted Saturday, chronicled how wealthy investors including Bill Gates,Tom Steyer and Vinod Khosla have poured money into the company, which hopes to take down the U.S. egg industry with offerings such as a plant-base mayonnaise. Andy Lee Robinson has updated his indispensable animation of sea ice volume – which makes the point yet again how dramatically northern sea ice is declining – despite the inevitable efforts of distorters and deniers. Also worth remembering that for total area of ice, we are at a low that is historic over not just the satellite era, but at least 1450 years into the past. 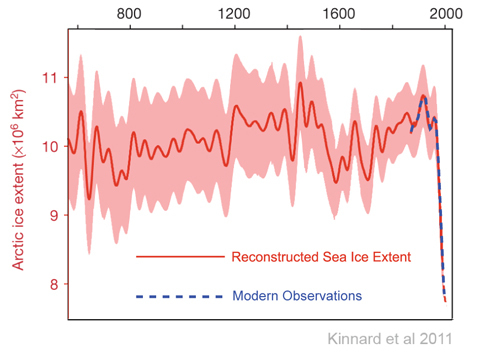 Look at the figure below, derived in 2011 from temperature proxies which were then compared to ocean sediments – (different critters live in iced-over ocean vs open water) and consider that the so-called “recovery” of sea ice is just a tiny squiggle at the bottom end of a 150 year long slide. Below, Dr. Walt Meier of NSIDC discusses the techniques of evaluating ice cover before the satellite record. Explanation at 2:53, if you’re in a hurry.